Is there a better alternative to Dragshare for Dropbox? Is Dragshare for Dropbox really the best app in Productivity category? Will Dragshare for Dropbox work good on macOS 10.13.4? 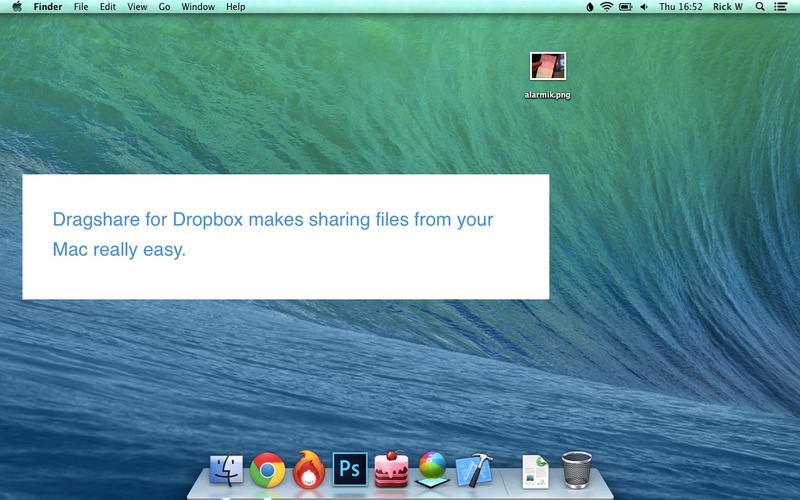 Dragshare makes sharing files through your Dropbox account really easy. Just drag one or more files to the icon in your menu bar and it will generate a Dropbox link for you to share. Your files are not uploaded to any other third party service and are safely stored within your Dropbox account. Drag multiple files to your menu bar and Dragshare will automatically zip them and create a link for your zipped archive. You can email/share your file afterwards. Note: The version level of the downloadable demo is 1.1.3. The version available for purchase from the Mac App Store is currently 1.1.4. Dragshare for Dropbox needs a review. Be the first to review this app and get the discussion started! Dragshare for Dropbox needs a rating. Be the first to rate this app and get the discussion started!